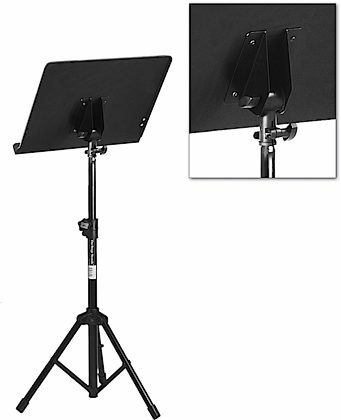 The On-Stage SM7211B is a revolutionary music stand that incorporates all the features of the past, adding a tripod folding base for the musician on the go. The On-Stage SM7211B stands can even fold up and nest together. - Adjustments fully extend shafts from 24" (sitting position) to 45" (standing position) and anywhere in between. - Hi-impact plastic leg housing, friction locking knobs, leg support straps, non-slip rubber feet, variable spreading legs. "It's a portable music stand for God's sake....it works perfectly in all applications I've run it through. Good bang for the buck"
Sound: This is a music stand. It has no sound..but if it did...I'd still own it. Feature: No accessories...and that's probably good. Doesn't need any accessories, and if it did have them....they would be a waste of time and space. This stand is fine as it is. Ease of Use: Open it up and go to work. Close it up and go home! That simple. Quality: I've owned two of these for many years and never had a problem with either one. Value: Good bang for the buck. Manufacturer Support: N/A The Wow Factor: N/A Overall: Does everything I've expected it to do. If I could change anything...I'd make it about 2-3 inches taller...but even that's not necessary. Sound: This was not an instrument but rather a music stand. It's very sturdy so I don't have to worry about an animal knocking it over. Feature: No accessories included. Ease of Use: Works as advertised. Quality: Very well made. Value: Well worth the price. Manufacturer Support: Not applicable. The Wow Factor: Aesthetically pleasing. Overall: Sturdy, reliable, well built.